This entry was posted on August 8, 2018 by Jessica Anderson. If you're like my husband, you anticipate your fantasy football draft for the entire year. Make the best day of the year even better by hosting a guys' weekend! Combine your passion for football as an excuse to get together with your buddies - make your fantasy football draft into an epic kick-off for the NFL season. Dudes, you need the weekend off. You work hard, take care of the kids, spoil your wives. 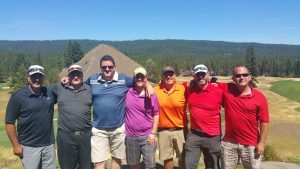 You deserve a weekend with your friends where you can play golf, deal cards, visit a casino, watch sports, and drink beer with your buddies. Your draft can go as long as you want, without worry about getting home, being responsible, or driving under the influence. Be as loud and rowdy as you like, there's nobody to wake. It's good for the wives too. No house to host at, no loud men to wake the kids, no snacks to clean up after everyone's gone. Just a nice, peaceful, relaxing weekend! 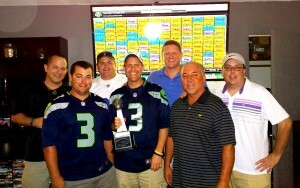 Golf, cards, and football - that's what a fantasy draft weekend is all about! If everyone in your draft is local, choose someplace that's close to drive, yet can fit your entire group. Renting a house is a great option, as you can be loud and can spread out during the draft. I would suggest a location that has other activities for the rest of the weekend, such as restaurants, bars, a golf course, a casino, fishing, hiking, or other outdoor activities. After all, it's summer, time to enjoy the outdoors before the weather turns! If the guys and gals in your draft are meeting from around the country, choose a location that's easy to get to from most airports. Vegas is always a great central location, with lots and lots of activities and many sports to watch and gamble on! If you’re not into gambling, find a winery with a golf course. Many hotels will have a conference room that can accommodate you. For any location, make sure your fantasy commissioner has space to set up your draft board and each player has a comfortable seat and room for their notes and of course, you're going to need to make sure there is wi-fi. The draft can last many hours, so you gotta make sure everyone is relaxed and comfy for the long haul. Will the leagues’ fantasy football trophy be yours this year? 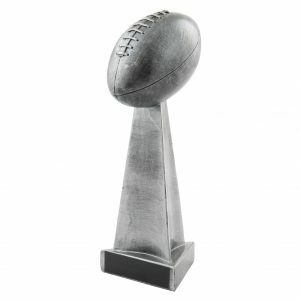 Bring your fantasy football trophy on the trip to put on display to up the ante and get everyone excited to start fresh with the new season. Don’t forget that it’s easy to send in your plate to get the new winner engraved each year! Good luck Fantasy Players! Wishing you an awesome, injury-free season! This post was originally published August 2016. It has been updated for content.